Carlo Zarri is the new rising star on the Italian cooking scene. I met Carlo several years ago at a promotional travel event. Carlo was with a delegation of business owners from the Piedmont region. Since that time I have sent clients to his hotel and restaurant and kept in touch with him regularly. Carlo’s reputation as a professional executive chef has risen to amazing heights over the years. He was the executive chef with the Italian ski team at the 2004 Winter Olympics in Salt Lake City and again with the Italian Olympic team for the Summer Games in Athens that same year. 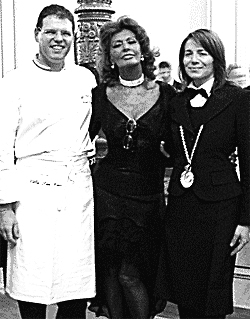 He catered the wedding dinner party for Carlo Ponti, Jr., the son of superstar Sophia Loren and her husband, movie producer Carlo Ponti. He coordinated the celebration party for the Ferrari racing team, an event that served about 650 people in November, 2004. Carlo is currently the chef and owner of the Hotel San Carlo in Cortemilia, a small town in the Langhe area of Piedmont, known for its white truffle production and for the fabulous Barbera and Barolo wines. 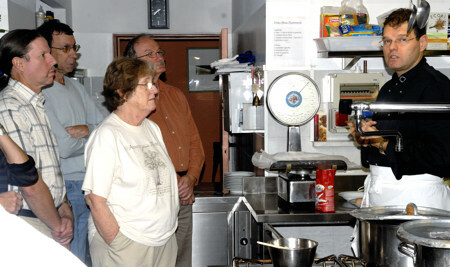 Carlo’s wife, Paola, is the sommelier who supervises the dining room and the wine cellar of their restaurant. Together, Carlo and Paola are offering some cooking and wine tasting classes for a small number or beginner to serious chefs and food lovers. €429, per person, based on double occupancy. Seasonal air and land supplements apply. Please, feel free to ask for details at time of booking. Additional supplements and restrictions may apply over local holidays. Package prices are subject to change without notice. Please, request airfare updated price before making the final payment. Prices are per person, sharing a room.